A cowboy who sings real cowboy songs—not the cardboard cookie cutter silver screen substitutes so popular at “cowboy” festivals these days; a folk singer who sings real folk songs—not their own “original” singer-songwriter pale imitations so popular at “folk” festivals these days; a raconteur who tells amazing epic tales of rambling round your cities and towns for the past fifty years with the likes of Woody Guthrie, Lead Belly and Billy Faier, a master acoustic guitarist who headlines New Orleans Jazz festivals—not some three-chord wonder who thinks “good enough for folk music” and a Baggs pickup will conceal the fact that they never venture above the third fret; a living legend who received America’s highest award for artistic achievement, the National Gold Medal for the Arts, the missing link between Woody Guthrie and Bob Dylan, and the subject of a feature-length documentary that tells his still-unfinished life story from sea to shining sea and across the Atlantic ocean to London—The Ballad of Ramblin’ Jack—that’s who is headlining the Santa Clarita Cowboy Festival on April 22nd this time around—Ramblin’ Jack Elliott, Last of the Brooklyn Cowboys. If there is one concert you don’t want to miss this year, this is it. The man is 84 years old and he is still on the road. It’s time to take a look back. Like America’s greatest 20th Century poet, Robert Frost, Jack Elliott had to go to England to be discovered and appreciated in his own country. That’s where he recorded his early English label Topic Records albums of cowboy, Woody Guthrie and Jimmie Rodgers songs—back in 1952 when no one knew who Woody Guthrie—the Dust Bowl Balladeer—was and had forgotten who Jimmie Rodgers—the original Singing Brakeman—was. Woody famously said “Jack sounds more like me than I do,” and it was Jack Elliott who taught Bob Dylan to sound like Woody Guthrie—since when Dylan met Guthrie in the Brooklyn State Hospital in 1961 Woody was dying of Huntington’s disease and no longer able to sing. When Dylan was becoming known in Greenwich Village coffeehouses that winter he was imitating Jack Elliott, not Woody Guthrie. If you can find one of those original recordings of Jack on Topic Records hang on to it for dear life—it is an irreplaceable piece of Americana the likes of a first edition of Edgar Allan Poe’s Tamerlane and Other Poems. Those records belong in the Smithsonian. But where did the “Elliott” come from? Ah, thereby hangs a tale, for Jack was born in Brooklyn, son of a surgeon. Was he Jewish? Don’t ask. Elliott was his first name, not his last, which was Adnopoz. The self-invention of Elliott Adnopoz into Ramblin’ Jack Elliott—no less than Samuel Langhorne Clemens becoming Mark Twain—is one of the great literary creations of our time. 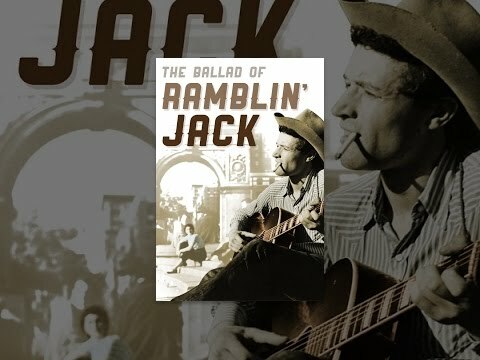 Lots of kids dream of running away from home to join the rodeo; Jack actually did—as a fourteen-year-old, where a cowboy taught him to play guitar and gave him a new name—Buck Elliott--which he was happy to give up when he became Ramblin’ Jack. But he didn’t give up the rodeo; he has been a working cowboy and a sailor both, and knows his way around a horse and a ship like a true professional. When he sings songs from either life they have the reality which can’t be imitated or faked. When Jack sings Woody’s Talking Sailor it has the natural feel of a real sailor talking; when he sings Buffalo Skinners you can hear the buffalo lowing in the background; and when he sings Woody’s 1913 Massacre you don’t feel like you’re in a folk club listening to a story, you feel like you’re in Calumet, Michigan on the union hall staircase in sight of the children on Christmas Eve, watching the tragedy unfold before your eyes. Once you’ve heard Jack’s version of these songs you don’t need to hear any others—you know the story inside out. I started listening to Ramblin’ Jack in the early sixties—back when the Topanga Banjo-Fiddle Contest was actually held in Topanga Canyon. 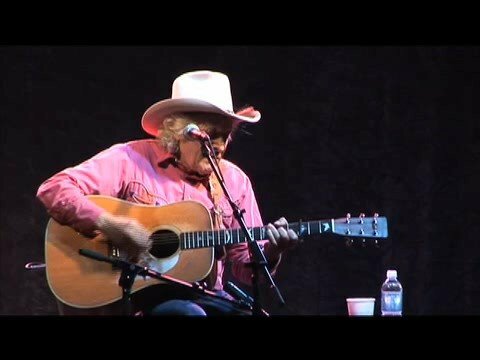 I have a vivid memory of him standing under a large spreading tree with his guitar and cowboy hat firmly in place, singing informally for anyone who was lucky enough to wander by. As the great line from Jerry Maguire goes, he had me at “Hello.” I loved both his flat-picking style (a refined adaptation of “Carter picking” named for Mother Maybelle with some Doc Watson licks thrown in for amazement and amusement) and fingerstyle, a more lyrical version of Reverend Gary Davis’s nerve-wrackingly difficult finger picking. Jack played Lone Cat Jesse Fuller’s signature composition San Francisco Bay Blues as a powerfully rhythmic and melodic flat-picking showpiece which opened all his shows back then and for many years to come. Every time he appeared at McCabe’s he had a unique way of entering the stage—from the back of the room, weaving his way up and down the aisle while playing this immediately identifiable opening song, like Moses parting the waters of the sold-out audience until he finally reached the staircase to the Promised Land—McCabe’s stage—and then finish the song behind the microphone. Only then would he reach up to his forehead, raise his eyebrows in acknowledgement of the crowd’s roaring welcome and remove his cowboy hat to place it securely on the tall stool next to the mic. Then he would place his harmonica holder (another accoutrement Bob Dylan picked up from Jack—who got it from Woody) around his neck and start the next song. Everyone else who ever played there enters from the green room above the stage, and makes a ceremonious descent down the staircase to the microphone. By the time Jack reached the microphone he already had the audience in the palm of his hand; and more significantly he wasn’t singing to us—but for us and with us. I don’t think another performer had the innate sense of the role of the folk singer as a voice of, by and for the people to pull that off—and to do it as naturally and seamlessly as Ramblin’ Jack. Had the burning bush suddenly materialized beside him I wound not have been surprised. The show was perfectly bookended—Jack left the same way he came in, slowly walking down the side stair case onto the floor and sang all the way to the back—then disappeared mysteriously into the night—as I once described him, like the smile of the Cheshire cat. Somewhere along the way he would do a few Woody Guthrie songs, a cowboy song, a Lead Belly song (with an introduction that made you think Lead was in the room—perfectly imitating his Louisiana inflected speech) and Reverend Gary Davis finger-picking classic Candy Man—which Jack played with a subtlety and finesse that would have grabbed even the Reverend’s acute attention. No one has ever played it better—with melodic picking on the bass strings playing counterpoint to the melodic picking on the treble strings. It remains the most challenging finger-style accompaniment I have heard. You can hear it on his first Reprise album Ramblin’ Jack Elliott, which was his first American release. Jack went on to record for Vanguard Records and Warner Brothers too. Some of those titles that stick in my mind are Bull Durham and Young Brigham and Ramblin’ Jack Elliott Sings the Songs of Woody Guthrie, the first album ever dedicated to Woody’s songs—and the one that presented Woody’s great songs for the first time by a first-class musician, world-class folk singer and virtuoso guitarist worthy of their own artistic place in American music and history. 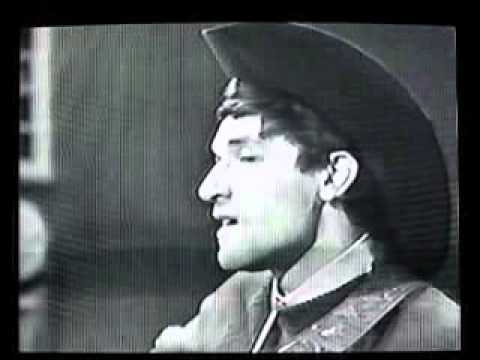 If you want to hear Woody’s songs the way they were meant to be sung—with all the husk and bark still in place—not denuded and cleaned up and stripped of all the whole grain nutrition Woody put in them—you owe it to yourself to hear Ramblin’ Jack sing them. If you have only heard them sung by Peter, Paul and Mary, or the Kingston Trio, or even the Weavers, (and this is painful to say) then you have been robbed of your heritage. Woody once said, “My voice is not one of the smooth-riding kind, because I don’t want it to sound smooth; I’d rather sound like the ash cans in the early morning, like the coyote howling, like the lone wolf barking.” That’s how Jack sounds, apropos of Keats, singing truth into beauty. Jack also ventured beyond the strict confines of folk music and adapted both modern jazz and rock into a unique hybrid style that absorbed some favorite songs of Ray Charles—I Love Her So and I’ve Got a Woman—which he boldly turned into one epic love song, playing Charles driving, pulsing piano accompaniment on his Martin D-28. And what other folk singer pulled off an acoustic arrangement of Keith Richards’ definitive Stones masterpiece Satisfaction? You may start looking around for the other instruments in the band, but there aren’t any—it’s just Ramblin’ Jack—ramblin’ all over the fret board. Jack Elliott is our greatest living folk singer—an American Master and true Original—and at 84 years old who knows how many more opportunities you will have to hear him. The Last Brooklyn Cowboy is coming to town again, and if it weren’t for Jack you may never have heard of Woody—or Bob. He brought them into their own. Don’t miss him!